Advance Recurring Callback enables merchant to receive detailed recurring callback data in JSON format. The normal callback setup will send a standard HTTP POST data to merchant. Login into your senangPay dashboard, go to Setting > Profile. Scroll down to the Shopping Cart Integration Link section. Under the Recurring Callback URL input field, you will se a checkbox to enable the advance callback setting. Tick the checkbox to allow senangPay to send the recurring callback data in JSON format. Untick to receive the standard callback data format. Once you enabled the advance callback feature, all your recurring callback will be sent in JSON with below data. recurring_id The ID of your recurring payment. status_id This is to indicate the status of the payment. It only has 2 values which is; 1 for successful and 0 for failed. order_id This is the order that was sent to senangPay. This is to identify the shopping cart transaction. msg This is the message to describe the payment status. The maximum length is 100 characters. Take note that the message may contain underscore. You can replace the underscore as space when displaying the message to your customer. Example: Payment_was_successful. hash This is the data to ensure the data integrity passed from senangPay to the merchant’s shopping cart. 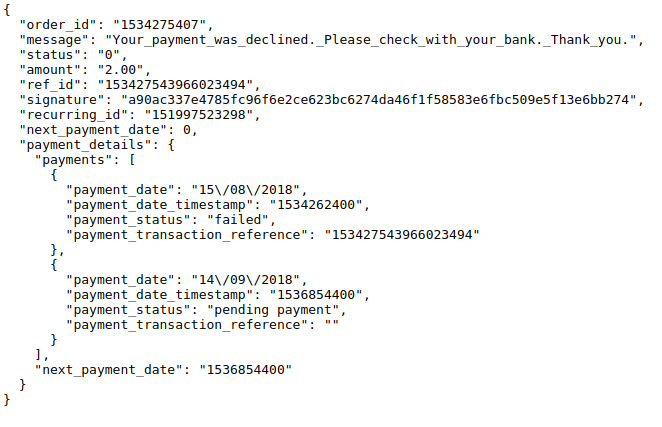 next_payment_date Next payment date in UNIX timestamp. 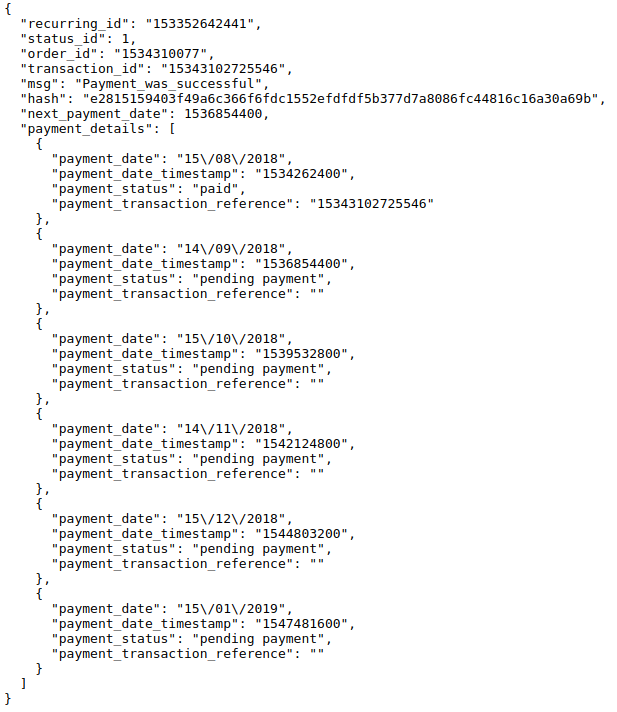 payment_details JSON array of payment schedule for recurring instalment, and payment history for recurring subscription. What if I have Return URL parameters set? Nothing is changed with the steps mentioned in our recurring API here. Enabled the advance recurring callback feature will only reflect the way senangPay send callback to your system.